The Inspire PT-1 offers a multitude of traditional power exercises as well as functional exercises. The unique cable system allows for both ½ and ¼ resistance, and the V-shaped base provides easy access for optional bench or stability ball. oval and round 11 gauge steel. 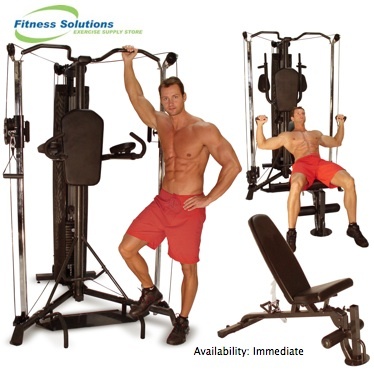 User-friendly adjustments: The quick, one-handed adjustable high/low pulley system adjusts to more than thirty height positions for all of your exercise needs. Weight Stack: 160lb. cast iron with solid guide rods and center drilled weight plates. Resistance: User can choose either .5 or .25 resistance depending upon the range of motion needed. handles and a multi-function belt. Options Available: Adjustable Bench, 50lb. weight stack upgrade. PT-1 Footprint: Depth 47" x Width 54" x Height 81.5"
PT-1 w/optional Bench: Depth 83" x Width 54" x Height 81.5"